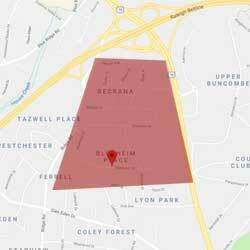 Blenheim and Beckana are neighborhoods located in Raleigh, NC. The neighborhoods offer townhomes and single-family homes, many of which branch off into cul-de-sacs. Homes in the Blenheim and Beckana neighborhoods were built between 1969-1981. The mature landscaping provides plenty of shade for the hot summers and create an established feel. Blenheim and Beckana are close to the beltline, NC State and downtown Raleigh. Square footage ranges from 2,000-4,500sq ft.